Iconic moments in British history, from the Stone Age to the 21st Century, will be presented in LEGO bricks at an exciting new interactive exhibition coming to The Novium Museum this summer. Bricks Britannia: A History of Britain in LEGO Bricks, features more than 30 stunning models built by Bright Bricks , the leading company for LEGO brick creations, including a show stopping 8m long model of the Flying Scotsman, the world's most famous steam locomotive, with light, sound and smoke effects. Using over 150,000 LEGO bricks, this is a must-see exhibition for the whole family, and a real treat for LEGO brick fans. The exhibition will feature interactive play tables, graffiti wall and a LEGO brick map of the UK, where visitors can leave their mark on the British Isles with their own unique build. "We are thrilled to be launching this fascinating exhibition at The Novium Museum," says Councillor Eileen Lintill, Cabinet Member for Community Services at Chichester District Council. "Adults and children alike will be amazed by the LEGO brick creations on display and we hope visitors will be inspired to create their own LEGO brick masterpieces. Families will not want to miss this exciting exhibition." The Novium Museum will be teaming up with Chichester Festival Theatre to put together an exciting events programme to accompany the exhibition. The exhibition will showcase a metre high model of Big Ben to celebrate Chichester Festival Theatre's production of The Midnight Gang this autumn, and events will include bespoke 'Make and Take sessions', a unique opportunity to dive into a brick pit of over 70,000 LEGO pieces and a special The Midnight Gang themed sleepover at The Novium Museum. Rachel Tackley, Executive Director of Chichester Festival Theatre says: "We're delighted to be 'ganging up' with The Novium Museum to deliver this exciting programme of activities. The Midnight Gang is the first dedicated family show to be presented at CFT during a Festival season, so we're especially pleased that local children and their families will be able to get creative themselves alongside it - and look forward to some great adventures, on stage and off." The Novium Museum will also be giving visitors the chance to see their own LEGO brick creations on display alongside the stunning Bright Bricks models. Winners will be selected by Duncan Titmarsh, the UK's only LEGO Certified professional. 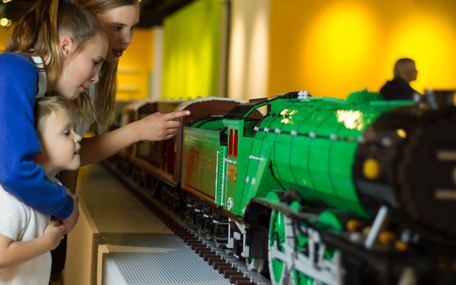 Budding LEGO builders are invited to create an iconic moment in the history of Britain, and enter one of three age categories. The exhibition will replace Game Plan: Board Games Rediscovered, a major touring exhibition from the V&A Museum of Childhood, which closes on Sunday, 1 July. Bricks Britannia: A History of Britain in LEGO Bricks opens at The Novium Museum on Saturday 28 July until Wednesday 31 October. Admission is free, with donations gratefully accepted. For more information about the exhibition, related activities and competition, please see The Novium Museum's website.